Sacred Heart University’s Student Government exceeded the goal for its second annual Hunger Project, packing more than 50,000 meals for Bridgeport food pantries and soup kitchens. Students leading the project—Anthony Smith, class of 2020 president; Gabe Bitencourt, class of 2021 president; and Sarah Kosha, student government president—partnered with Meals of Hope, a company that practices a hands-on approach to battling hunger, to run the event. Meals of Hope provides healthy, good-tasting, affordable meal components to organizations and companies that sponsor and host community food distribution activities like the Hunger Project. Students participating in the Hunger Project formed assembly lines to pack meals for people in Bridgeport who are experiencing daily food shortages. This year’s goal was to package 50,000 meals, but with the help of 600 volunteers, the Student Government exceeded its goal and packaged 50,820 meals. 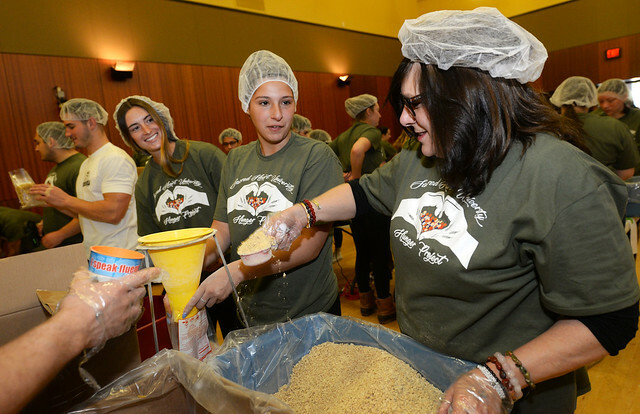 If you are unable to view the photos above, visit the SHU Hunger Project 2019 Flickr gallery.